This was the second time in Phillies minor league spring training games we have watched the two A ball teams. Each time reliever Jakob Hernandez and second baseman Grenny Cumana stood out. Hernandez now has struck out eight and not walked a batter or allowed a run in 3.1 innings in the two games we have seen him pitch. In Sunday afternoon’s game against the high A ball team of the Pittsburgh Pirates, Jakob was just as impressive as he was in the first game we saw him pitch earlier in the week. Watch his four strikeouts from Sunday, HERE. On of the smallest players at 5′ 5″ Cumana is fighting for a spot on a Phillies minor league team roster when the season opens. Fellow Venezuelan, the Astros Jose Altuve is listed at 5’6″. Grenny is now in his sixth season in the organization and has a career .256 average playing the middle infield positions. In today’s game Grenny hit a hard ground ball single through the 5-6 hole. I did not need to be told the exit velocity of the hit. It was was one of the hardest ground ball base hits we have seen this spring. Watch HERE. On the other hand, Kyle Young might be the tallest pitcher ever in pro baseball. He pitched in Williamsport last season going 7-2 and striking out better than a batter and inning. The big question is Kyle 7 foot tall? We think he is!. If not he looks like it when opposing batter face him. He started the low A game and had a challenging start giving up an opening double by a left-handed hitter down the left field line. After giving up a run in the first inning, he settled in and shutdown the Pirates in his next two innings of his three inning start. He struck out four. Watch one of his strikeouts HERE. A big international free agent signing back in on Jun 10, of 2015, Jhailyn Ortiz played in only 47 games last season with Williamsport, all in right field. He finished strong hitting .375 in his last ten games for Williamsport. In 2017, Jhailyn was a MILB.com organization All-Star, Baseball America’s Short Season All-Star and a Mid-Season All Star in the New York Penn League. In Sunday’s high A game he hit a long drive that appeared to be out of Ashburn Field but the wind held it up and the ball hit off the fence for a RBI double. Watch HERE. Follow the progress of these four guys. It will be interesting to see where they end up in 2018. 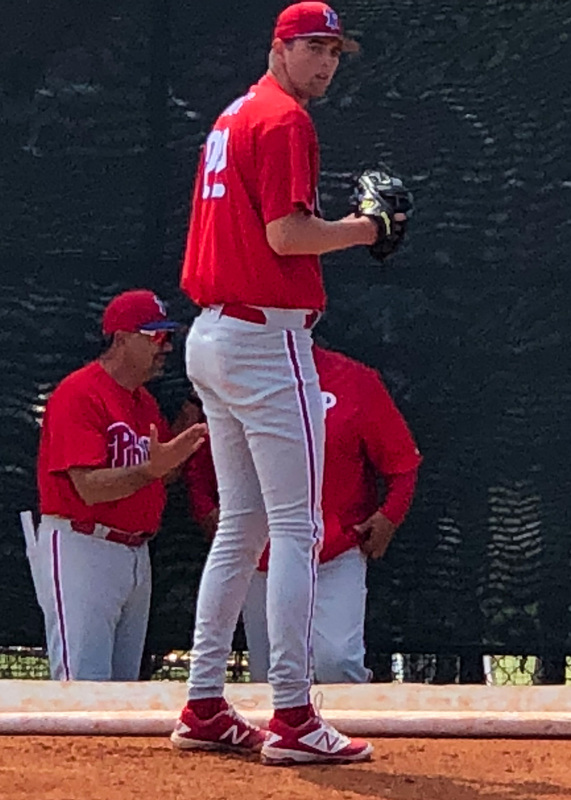 This entry was posted in 2018, March and tagged 2018 Phillies minor league spring training, Baseball Betsy, Baseball Ross, Grenny Cumana, Jakob Hernandez, Jhailyn Ortiz, Kyle Young, Philadelphia Phillies. Bookmark the permalink.